For some reason this song was in my head this morning and as usual I just had the chorus and a few of the words. Curiosity got the better of me so I asked my buddy Mr Google about it. 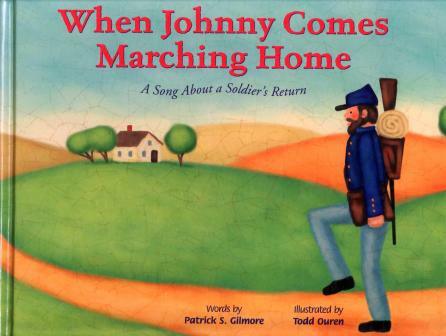 It was a popular song of the American Civil War that expressed people’s longing for the return of their friends and relatives who were fighting in the war. It was written by the Irish-American band leader Patrick Gilmore during the American Civil War who for some reason put the song out under a pseudonym “Louis Lambert” (very fancy!). He is said to have written the song for his sister Annie as she prayed for the safe return of her fiancé, Union Light Artillery Captain John O’Rourke (another Irishman? ), from the Civil War. The lyrics are quite hilarious in particular the use of the word “gay”, reminding us that not so long ago we used this word to describe someone who was happy..remember the chain of Irish female fashion stores Gaywear that changed their name to A-Wear? Here goes, lets welcome home our darling boy ..
You can sing the song yourself to the American Military West Point Band if you are in the mood! This entry was posted on November 17, 2015 at 8:57 am and is filed under Entertainment, History. You can follow any responses to this entry through the RSS 2.0 feed. You can leave a response, or trackback from your own site. Can you imagine that happening today ..Volunteer for my country?? Are you out of your head !